PETALING JAYA: Although the supply of hotel rooms in Kuala Lumpur is quite adequate, property consultants say some segments of the market are still underserved. As of 2010, the total supply of 3- to 5- star hotel rooms in Kuala Lumpur stood at 23,972, of which 5-star rooms accounted for 50%. Zerin Properties chief executive officer Previndran Singhe said the entry of international brands of the likes of Fairmont, W, Four Seasons, Conrad, Bulgari and MGM would augur well for the market. “There is also room for limited service hotels or branded budget hotels such as Tune Hotels and Holiday Inn Express; ethnic hotels like India's Taj and Oberoi; eco-tourism products at all luxury levels; and limited serviced apartments in the likes of Citadines,” Previndran told StarBiz. The supply of true blue serviced residences was also limited, he said, adding that many of them were actually live-in apartments. CB Richard Ellis (Malaysia) vice-president research, Nabeel Hussain, said there were very few internationally-branded three-star hotel chains within Kuala Lumpur, and some of the larger serviced apartment operators, such as Oakwood, were absent from the market as well. A number of new hotel projects are under development and the most anticipated include the new Grand Hyatt, scheduled to be completed next year, and the St Regis in KL Sentral, scheduled for completion in 2014. Also in the pipeline are properties managed by All Seasons and Hilton's Garden Inn, two internationally-known budget hotel brands. Nabeel said a number of the large international groups, such as Accor, Hilton and Starwood, have a significant presence in Kuala Lumpur and appear to be looking to increase their hotel portfolio. On hotel room rates, Previndran said rates in the luxury sector were still underperforming and were expected to increase. “As globalisation sets in further, borders will be blurred and we will see parity setting in with our neighbours,” he pointed out. Nabeel said generally, any increase in hotel room rates needed to start with the top-end properties and anticipated that properties such as the Grand Hyatt would set a new benchmark for the top end of the market. 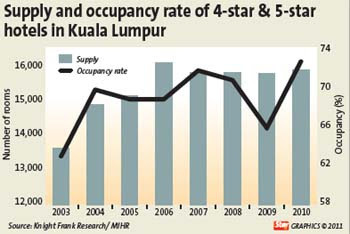 “At the moment, Kuala Lumpur has some of the lowest room rates for five-star properties in the region,” he added. In its latest quarterly report on Kuala Lumpur's hospitality market, CB Richard Ellis Research said drivers for increased business and tourism spending might come from an improving economy (2011 GDP growth is projected to be 6%-6.5%) and a number of new initiatives being considered by the government. It said the opening of the Pullman Kuala Lumpur Bangsar (Accor's largest hotel in Southeast Asia with 515 rooms) later this year and the Grand Hyatt in 2012 might lift rates at the upper-end of the market, which could then have a knock-on effect in the 3- and 4-star hotel categories and also the service apartment segment, which competes for many of the same customers. The luxury segment of the hospitality market, comprising mostly 5-star hotels, recovered in 2010 as full-year average occupancy for 5-star hotels reached 68%, up from 2009's 58%. CB Richard Ellis said although average room rates were lower in 2010 than in 2009, the net effect was positive, as revenue per average room (RevPAR) for this segment was RM224 in 2010 compared with RM196 in 2009, an increase of 14%. In fact, RevPAR for all three segments of the market 3-star, 4-star and 5-star - improved in 2010. Knight Frank Research said supported by concerted government efforts to attract more foreign tourists through innovative tourism packages and products, the hospitality sector was expected to continue to grow steadily into the first half of 2011. It added that under Budget 2011, an allocation of RM85mil has been made for the provision of infrastructure facilities to facilitate construction of hotels and resorts in remote areas. Another RM50mil allocation is to build covered walkways in the KLCC-Bukit Bintang area. SINGAPORE -- Maybank Singapore today launched two innovative home loan packages, the Hybrid Rate Home Loan and the Ceiling Rate Home Loan. While the Hybrid Rate Home Loan marries both the floating and fixed rates, it differs from the traditional home loan structure in which interest rates are fixed for the first year and float thereafter. Pegged in the first year to the three-month Singapore Interbank Offered Rate, customers can take advantage of the current low interbank rates now, and thereafter enjoy the certainty of fixed rates in the subsequent second or second and third years. "This is a radical move from what the market now offers," said Helen Neo, the bank's head of consumer banking, at the launch here. SP Setia Bhd, Malaysia’s biggest property developer, rose to a three-month high in Kuala Lumpur trading after AmResearch Sdn Bhd raised the stock’s fair value to reflect higher real estate prices and earnings growth prospects. The stock gained 2.3 per cent to RM6.67 at 10.18 am local time, set for its highest close since January 17. The fair value for SP Setia was increased to RM8.10 from RM7.38, Benny Chew, an analyst at AmResearch, wrote in a report today. More Chinese cities saw the cost of new homes fall in March, official data showed on Monday, leading to suggestions that government moves to cool the real estate market could be having an impact. The National Bureau of Statistics data, which came a day after authorities moved to further limit banks' lending, showed prices of new builds were lower in 12 of the 70 major cities tracked in March compared with February. Eight cities had seen prices decline in February, while just three did so in January.Home prices were unchanged in eight cities in March, while 29 cities posted gains smaller than those seen in February. Among major cities, Beijing prices were unchanged, while Shanghai saw a scant 0.2 percent rise, the statistics bureau said. However, analysts said the data was unlikely to spell an end to government efforts to tamp down the market over the near term. "The easing monthly property price data showed the administrative measures are having effect," said Chen Sheng, vice president of the China Index Academy, a property research institution. "But authorities will not soften their stance, so as to prevent any possible price rebound. "China has introduced a number of measures to cool the market since late 2009, including bans on buying second homes in some cities, while cities such as Shanghai and Chongqing have introduced trial property taxes. On Sunday the central bank raised the amount of money banks must keep in reserve, effectively cutting their lending power, as it tries to rein in inflation, which last month hit its highest level since July 2008. It has also raised interest rates four times since October.Premier Wen Jiabao told China's legislature last month the government would ramp up a campaign to build affordable housing in a bid to head off growing public concern over rising prices. The March data marked the third monthly survey since the government scrapped a nationwide property index and switched to publishing the date for individual cities. The old method, which gave an average of prices nationwide, had been criticised by some as understating price growth by diluting large spikes in big cities with tamer changes in smaller ones. LONDON: London home owners are set to rake in about 114 million euros from rental income over the weekend of William and Kate's royal wedding. Asian, American and other international visitors are prepared to pay top prices for a room, even if it is in someone's home. London's shortage of hotels has prompted royal wedding fans to look for alternative places to stay, raising questions over the city's accommodation needs during the Olympics. Property experts said London's steep hotel prices and shortage of rooms have prompted a 40 per cent spike in demand.